Giving the account back to Jeremy now. Update: I’m not switching blog guys!! You just got confused. I’m switching WordPress accounts, because I was borrowing my cousin’s account because my main got hacked. Now, I found the one I had on watex.wordpress.com. I am using the real account right now. My cousin Jeremy needs my WordPress badly. You see, I was borrowing it. After a long time, I finally suceeded to get back my main WordPress account. I thank you all for coming to this site frequently. I will be posting now with my main account, Watex. So, catch you later. The new pin is at the Beach. Guys, people in Card Jitsu are catching up!! Click here to go on my tutorial on Card Jitsu. Well, many people are getting confused about this suspending and all the other things. There is a guy, the link is watexscheats.wordpress.com. He’s saying that I quit, and links everyone to Dojo Penguins. No, this is not true. I DID NOT quit. 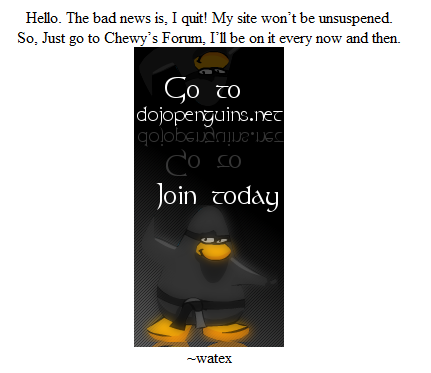 I got permanently suspended on my old site, watex.wordpress.com. I got suspended 3 times, the third time for posing about Prize Rebel, the free membership site. Guys, please believe me that this site is real, I did not quit! Here is a screencast of watexscheats. I’m not a very good friend of Chewy. I’ll tell you why these are fakes. I don’t add that much people on the blogroll. 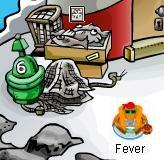 You see my penguin’s name? It’s kinda gray. He copied it from a jpeg file so it’s 99.9% fake. I make widgets more like this. I am more comfortable working alone by myself on my site. I always never let people be editors. NOTE: NEVER LISTEN TO EZNO ON THE COMMENTS. HE ALWAYS LIES. Update: Many of you were asking if there were cheats for ninjas. I found the Item IDs. These only work with Penguin Storm. Hey guys, Watex here. 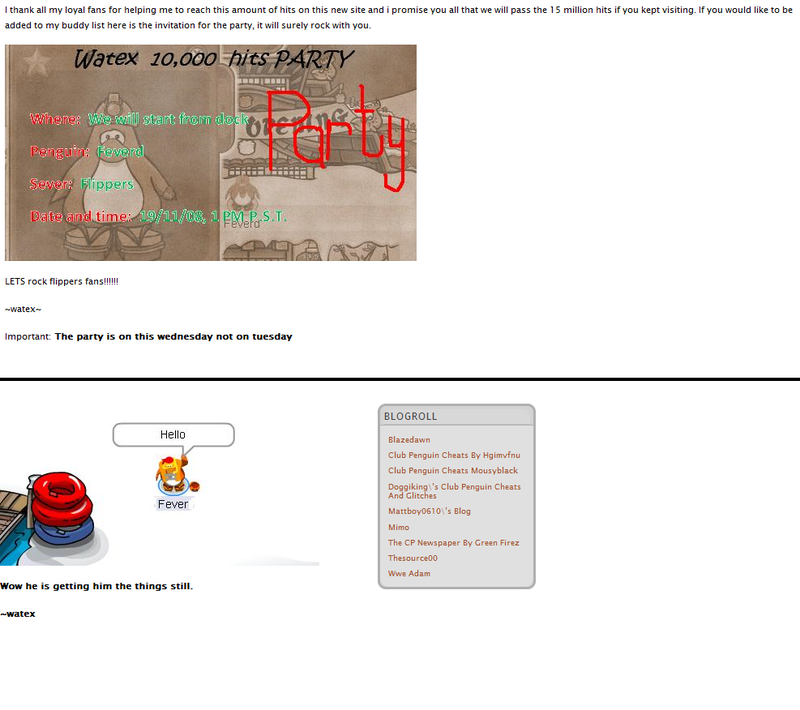 Billybob announced that the Card-Jitsu was really popular that I had to go to another server other than Yukon, LOL. 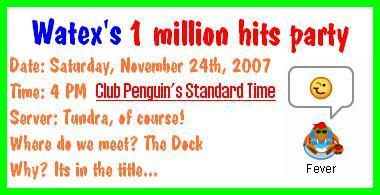 For a hint to log on, you should go on Miniclip’s Club Penguin, it’s better for me. Update 3: There is a 79.9% chance that going to five bar servers work better. And yes there is a big update. When a room is full, it brings you back to the place you were before you used the map and the map pops up. It’s really annoying, I agree. I have to tell you how to play. It’s really confusing. Put your mouse over the chair around the right side. You sill see the Sensei popping up. Click on him. If the card is tied, the higher number wins. Have the same type, but have all of it each in different colors. The other way to win is to have everything in different colors. When the opponent has 2 of the different of fire, water, or ice, try to get the highest number that can beat the one that has 2 fire, water, or ice. Grab the highest number card you have. If you win 5 times (not in a row, but it’s possible), then you advance and receive a new belt. When the opponent has 2 of the different colors and icon, let’s make an example. The opponent has 1 red fire and 1 yellow ice. There is 80% chance that he will choose water. So think of a type of card that can beat water. The answer is ice, because ice freezes the water. So choose ice. You will have a high chance of getting that one. When you have 2 of the different color and icon, let’s make an example. You have 1 red ice and 1 yellow fire. The opponent will predict that you will put up water. So when the opponent gets the water card, you have to think of something that can cool. The answer is Fire. So use fire. Do that over and over again until you win. NOTE: You do not have to get black belt in order to become a ninja. If you beat the Sensei, you can go to a room. Click here to see it. Hey guys, Snow Dobby, the guy on my blogroll, was suspended. Here is a poll if I should remove him or not. Here’s another poll. Sorry for giving many polls, but this is important. Snow Dobby was my friend for a long time. Just like my other site, I had to make the rule again. 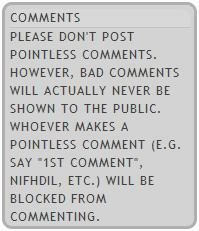 Spammy comments will anyway with Akismet, but it bothers me and a lot of my fans.